One of the greatest passers and quarterbacks to play football. Came off the bench in 1924 to become one of football's immortals. As a sophomore he played only five minutes as Red Grange and Illinois defeated Michigan, then guided the Wolverines to a 3-0 victory over the Illini in 1925. Played 60 minutes of every other game. 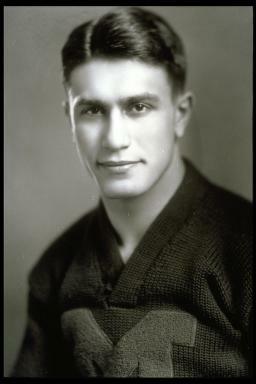 Earned Chicago Tribune's Silver Football as the Big Ten Conference's MVP in 1926. Later starred for such pro teams as Cleveland, Detroit, New York, and Brooklyn. All-pro quarterback five years. Later entered coaching and then became athletic director of Brandeis University. Selected to both National and Michigan Hall of Fame.